This performance uses sculpture, movement, costume and interactive elements to discuss and disrupt cultural ideas of whiteness and femininity, focusing on transformation and increased accountability. More info at www.dirtywhitematter.com. Performance by Meg Stein in collaboration with Austin Dixon and Alyssa Noble. DIRTY WHITE MATTER explores & mutates cultural ideas of whiteness & femininity using sculpture, performance & interactive elements. AiOP performances are presented in collaboration with Jessica Harris and Sarah Konner and with the help of Jennifer Hadlock and Susan Stainman. DWM photos by Derrick Beasley. AiOP 2018 NYC BODY is curated by Katya Grokhovsky. More info on Dirty White Matter at dirtywhitematter.com. AH Arts is pleased to announce a special performance of DIRTY WHITE MATTER, by Meg Stein with Jessica Harris and Lily Gold. DIRTY WHITE MATTER is an exploration of white femininity, with the joint aims of de-purification and accountability. Using movement, costume, and sculptural objects, artists Meg Stein, Jessica Harris and Lily Gold claim and mutate the visual language of their own whiteness and femaleness. This site-specific performance envisions a new future of femininity and a legacy for whiteness while reckoning with the present and past. Beginning as a community-based art collaboration originating in Durham, NC, DIRTY WHITE MATTER arrives in New York for its first iteration at Victori + Mo Gallery in Bushwick. This performance is an excerpt from an ongoing series of projects that take the form of sculpture, group discussion, recorded interviews, dance and guided art exercises to engage the audience in questions of whiteness and white femininity. Through interpretive movement, Jessica Harris and Lily Gold reflect, engage and embody the issues at play, while Stein manipulates materials that are specifically fashioned from white cotton: tampons, Q-tips, face pads, etc., and are utilized intimately on primarily female bodies. These bleached materials, which merge white coloring with “cleanliness” and “purity,” thereby are visually representative of the perpetuated narratives we are told about whiteness. In her performance, Stein fosters a dialogue surrounding these everyday materials, the processes these materials undergo in order to obtain their bright white coloring, and the significance of such production. She implores her Caucasian viewers to evaluate their own whiteness and how it relates to these cotton materials. 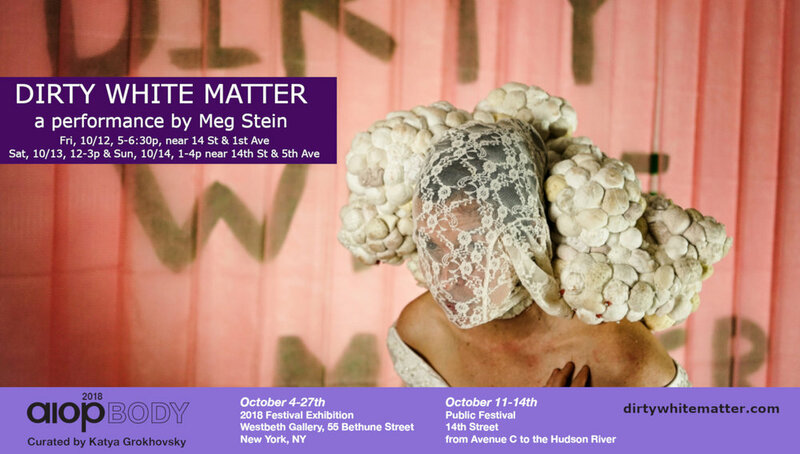 With the August 8th performance of DIRTY WHITE MATTER, Stein, Harris & Gold engage the audience in questions of whiteness and white femininity through both the performance and the surrounding sculptures in the exhibition, IMPERFECT MUSINGS: Emily Barletta + Meg Stein. DIRTY WHITE MATTER will be returning to New York for a second iteration as part of Art in Odd Places 2018. Curated by Katya Grokhovsky, AIOP 2018: BODY presents projects by women, female-identifying, and non-binary artists along 14th Street, New York on October 11-14, 2018. Meg Stein is a visual artist based in Durham, NC. AH Arts is currently presenting her sculptural work in IMPERFECT MUSINGS at 56 Bogart St. She previously exhibited at A.I.R. Gallery, Vox Populi, Governors Island Art Fair, Greenhill Gallery, the Neon Heater, & the Spartanburg Museum of Art. Stein’s residencies include Yaddo and The Hambidge Center, where she received the Garland Fellowship. Most recently she was awarded the Ella Pratt Emerging Artist Grant and was selected as the NC Fellow for South Arts. Jessica Harris is a choreographer, dancer, educator, and oracle. She works at the intersection of mind and body, a practice that informs three of her main ventures: Oracle Acts, an interactive entertainment company for parties and events; Body Brain Kids, a preschool program which uses movement to teach letters and numbers to children; Decision Harmony, a consultancy which uses movement to analyze how individuals and teams make decisions. As a choreographer and dancer, Ms. Harris is a founding member of Shen Wei Dance Arts and danced with the company for more than ten years. Lily Gold has been making dance in New York since 2012. She also creates paintings, objects, experimental short films, and music. In 2017, Danspace Project presented Gold’s first evening-length dance, “Good Mud.” Residencies include the Zil Cultural Center in Moscow (2016), Movement Research (2015-16) and AUNTS (2013).